Quento is a fun little math game that is a great challenge for all levels and ages. The objective is simple: use the available numbers and operations to get the indicated result with the indicated amount of numbers. However, not only are you restricted to the available numbers and operations, but you have to be able to create the expression by dragging your finger over them in one swipe -- and order of operations matters! Each puzzle is displayed as a 3x3 grid with five numbers and four operations. The operations are always addition or subtraction. Above the puzzle, you'll see the objectives, like to get an 8 with three numbers. Each level (number of numbers) has three goals and you get a star for each one you accomplish. Once you complete the level, you advance to the next one. After you complete a few rounds, a new "Free Play" mode will unlock. In Free Play, you are simply given a number and your goal is to get the number with any number of numbers that you wish. There are no stars to earn or levels to complete -- you simply try to get the indicated number with no pressure. 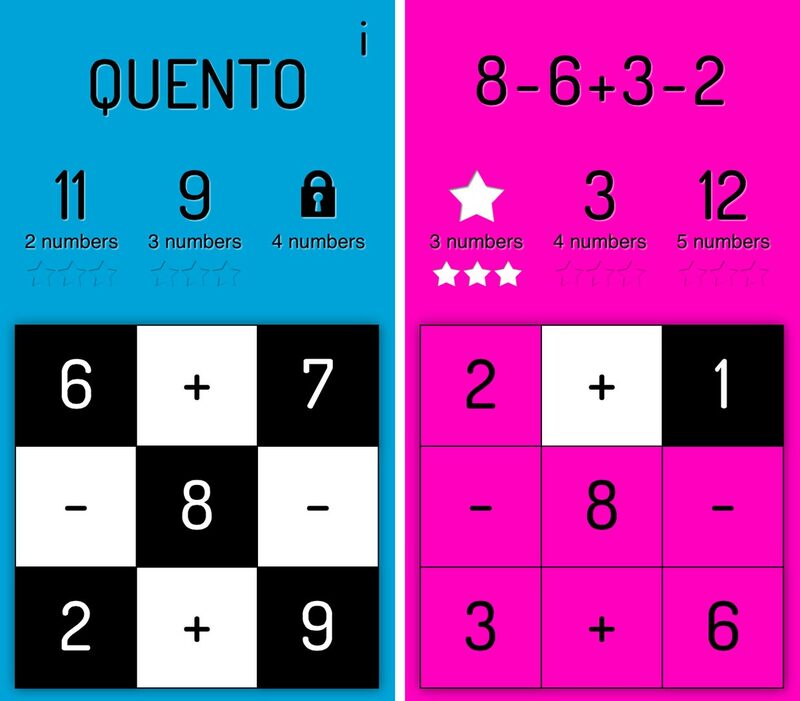 Quento is a free game to download, but only includes levels for using 2 or 3 numbers in your expressions (about medium difficulty). 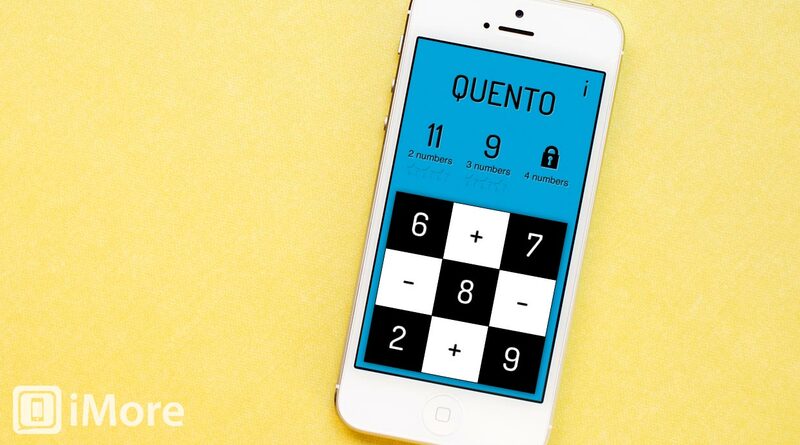 To unlock puzzles using 4 or 5 numbers, you must make an in-app purchase of $0.99. If you get stuck on a puzzle, you can simply shake to give-up and start a new puzzle. Puzzles only include addition and subtraction. It'd be great to add puzzles that include multiplication and division for an even greater challenge. On the iPad, the game is very small even though it's a "universal" app. Would prefer the puzzles to be displayed bigger since iPads are typically held farther away. 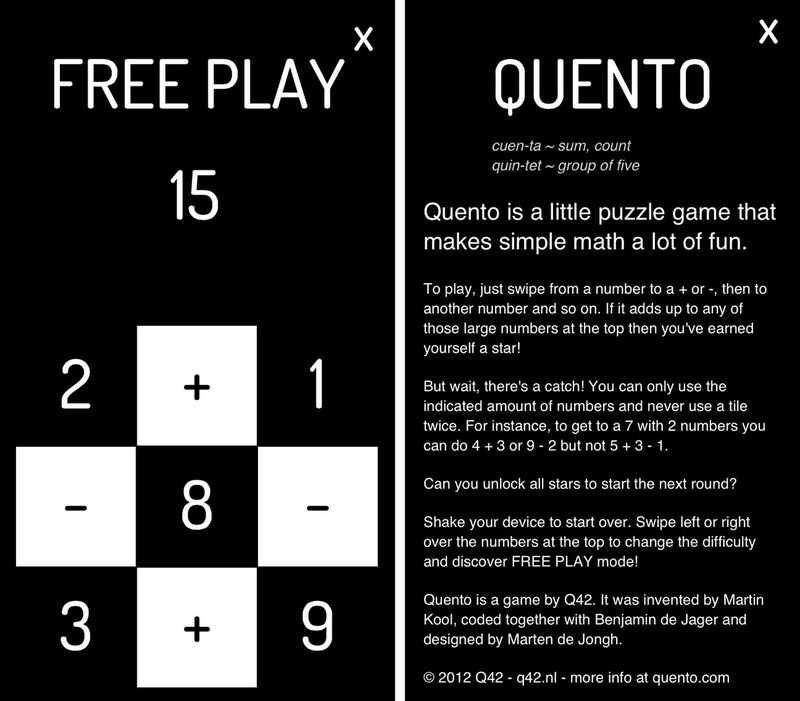 Quento is an excellent math puzzle game for all ages. Both young kids who are just learning to add and subtract and experienced mathematicians will enjoy Quento. Puzzle games like this are some of my favorite because, well, I'm a math nerd, and because they are great for your brain.